Customisable Lexmark e-Task touchscreen accesses workflow solutions with a single touch. With the Lexmark X762e and the optional Lexmark Document Solutions Suite Software, simplify business processes with interactive prompting for document distribution, real-time indexing, routing and archiving. One MFP for workgroup printing and copying needs in colour or mono with comparable mono cost per page as a mono laser printer. Enhance communication with the power of spot colour for little or no cost over black and white. 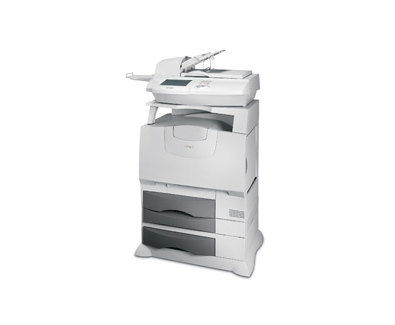 Consolidate and reduce equipment costs, supplies and service to one device for scanning, printing, copying and faxing. Intuitive Lexmark e-Task 7.7" colour touchscreen interface to easily access print, copy, fax and scan functions standard. Quick time to first colour print in less than 15 seconds and the 600 MHz RISC processor with 256MB of RAM helps get jobs done in a hurry. Maximise productivity at 4800 Coluor Quality with up to 25 ppm for vibrant colour printing, and mono scanning at 24ppm and colour scanning at 14 ppm. Labels, Banner Paper, Card Stock, Plain Paper, Transparencies, Envelopes, Refer to the Card Stock & Label Guide.